Showing a list of bars. This might come in handy if you want to do a long sequence of skills or emotes, without having to remember it all. You can also export a sequence and e-mail it to your friends, to share your favorite skill rotations. As shown in the video, you can configure the bars to interact with each other: When one sequence finishes, you can make that bar close and another bar open. You can also make them open or close when combat begins or ends. Bars can be grouped together hierarchically. 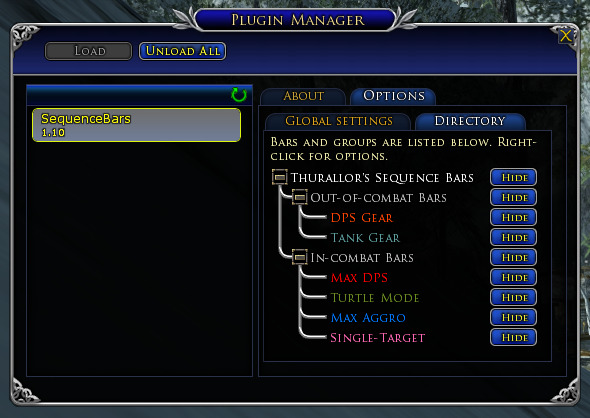 You can use the options panel in the plugin manager to see a list of your SequenceBars (and groups of bars). You can right-click on any item for options. The visual appearance of the bars is highly configurable, using right-click menus. This plugin is still under active development, so comments and suggestions are appreciated. Or if you prefer, you may use Plugin Compendium to do the installation. 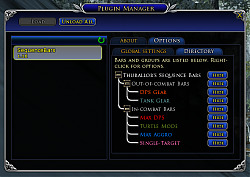 To load the plugin, use the game's built-in Plugin Manager. This can be found in the "^" menu, at the bottom of the screen. Click the icon, then choose "System" and then "Plugin Manager". When the Plugin Manager opens, find SequenceBars in the list on the left side, then click "Load" to load the plugin. If you would like the plugin to load automatically each time you login, choose your character's name in the "Automatically Load For" pulldown menu. (28-Jan-2019) Version 3.35: Release notes are here. (26-Jan-2019) Version 3.34: Release notes are here. (29-Sep-2018) Version 3.33: Release notes are here. (11-Sep-2018) Version 3.32: Release notes are here. (22-Aug-2018) Version 3.31: Release notes are here. (19-Apr-2018) Version 3.30: Fixes a bug reported by tazwhirlwind: In the previous version, sometimes the right-click menu for bars didn't work. (28-Mar-2018) Version 3.29: Fixes a bug reported by Galphoglas. You can now use special characters (such as é, è, à) in chat commands. (17-Feb-2018) Version 3.28: Fixed bugs introduced in 3.27. (17-Feb-2018) Version 3.27: Release notes are here. (14-Feb-2018) Version 3.26: Release notes are here. (3-Feb-2018) Version 3.25: Fixed a bug in the color picker. (13-Nov-2017) Version 3.24: Release notes are here. (10-Oct-2017) Version 3.23: Release notes are here. (8-Oct-2017) Version 3.22: Release notes are here. (4-Oct-2017) Version 3.21: Release notes are here. (1-Aug-2017) Version 3.20: Release notes are here. (31-May-2017) Version 3.19: Added Runekeeper conditionals "Runekeeper attunement > x", "Runekeeper attunement < x", "Runekeeper is charged", "Runekeeper is not charged". (19-May-2017) Version 3.18: Forgot to add the "/sb sort" command. (19-May-2017) Version 3.17: Release notes are here. (2-Apr-2017) Version 3.16: Release notes are here. (26-Mar-2017) Version 3.15: Second attempt to fix stance-tracking conditionals for Wardens. (25-Mar-2017) Version 3.14: Release notes are here. (5-Feb-2017) Version 3.13: Release notes are here. (31-Dec-2016) Version 3.12: Release notes are here. (14-Nov-2016) Version 3.11: Release notes are here. (4-Oct-2016) Version 3.10: Release notes are here. (25-Aug-2016) Version 3.09: Release notes are here. (9-Jun-2016) Version 3.08: Release notes are here. (25-Mar-2016) Version 3.07: Bug fix. (23-Mar-2016) Version 3.06: Quick fix for this bug. (22-Mar-2016) Version 3.05: Added "Skill is/not usable" condition. (22-Mar-2016) Version 3.04: Release notes are here. (12-Mar-2016) Version 3.03: Bug fixes. (24-Feb-2016) Version 3.02: Fixed file permissions that caused an error when updating with Plugin Compendium. (23-Feb-2016) Version 3.01: Fixed a problem with upgrading old settings files. (22-Feb-2016) Version 3.00: Release notes are here. (14-Feb-2016) Version 2.26: Release notes are here. (11-Feb-2016) Version 2.25: Release notes are here. (22-Jan-2016) Version 2.24: Release notes are here. (10-Jan-2016) Version 2.23: Release notes are here. (11-Dec-2015) Version 2.22: Release notes are here. (10-Dec-2015) Version 2.21: Release notes are here. (4-Dec-2015) Version 2.20: Release notes are here. (30-Nov-2015) Version 2.19: Release notes are here. (20-Oct-2015) Version 2.18: Release notes are here. (30-Sep-2015) Version 2.17: Release notes are here. (28-Aug-2015) Version 2.15: Release notes are here. (22-Aug-2015) Version 2.14: Release notes are here. (17-Aug-2015) Version 2.13: Bug fix: SequenceBars will no longer steal focus from the chat window when show/expand event behaviors are executed. (15-Aug-2015) Version 2.12: Screen resize warning now has a "Don't show this message again" checkbox. (11-Aug-2015) Versions 2.10 and 2.11: Release notes are here. (16-Jul-2015) Version 2.09: Release notes are here. (8-Jul-2015) Version 2.07: Release notes are here. (11-Jun-2015) Version 2.06: Release notes are here. (9-Jun-2015) Version 2.05: Release notes are here. (4-Jun-2015) Version 2.04: Release notes are here. (11-May-2015) Version 2.03: Added a mechanism for discovering bag slot numbers: If you move an item from one slot to another within your bag, you will see a message such as "Item moved from bag slot 103 to bag slot 45" in the chat window. This should help in assigning the bag slot in the "Set unequip destination" command. (7-May-2015) Version 2.02: Fixed a bug that caused incorrect scrolling when you "skip ahead" in a sequence. Also added Cyrillic support for the Turbine client. (26-Apr-2015) Version 2.01: Release notes are here. (23-Apr-2015) Version 2.00: Release notes are here. (10-Apr-2015) Version 1.12: Fixed a bug in the sequence editor that caused icons to disappear when you tried to drag them. (3-Apr-2015) Version 1.11: Release notes are here. (12-Jan-2015) Version 1.10: Reorganized the options panel. Bug fix: The "Cursor Style" submenu was not displaying properly in the Bar menu. Bug fix: The cursor was not being moved correctly if a bar automatically moved due to a user event during animation. (6-Jan-2015) Version 1.08: Quick fix for a bug I introduced in Version 1.06 which generated an error when you tried to edit the caption of a bar or group. (2-Jan-2015) Version 1.06: Release notes are here. (1-Jan-2015) Version 1.05: Release notes are here. (2-Nov-2014) Version 1.04: Release notes are here. (30-Oct-2014) Version 1.03: Completed Russian translations. Addressed some minor GUI flakiness issues. Added "Directory" option to the Bar menu. (27-Oct-2014) Version 1.02: Oops, I inadvertently messed up the .plugin file in the 1.01 version. (27-Oct-2014) Version 1.01: Updated Russian translations (Thanks, DToX!) and added support for Plugin Compendium. (27-Oct-2014) Version 1.00: Initial release. My bad - keep up the good work! Last edited by Danglin : 01-29-2019 at 06:06 AM. Thanks for reporting the issues. I'll look into it. Edit: Both issues are fixed in version 3.35. I am assuming (although you didn't state it explicitly) that you have the "Advance to next slot when skill is executed" option enabled for your "Spear and Shield" skill. If not, then please let me know; there may be another problem I don't know about. Last edited by Thurallor : 01-28-2019 at 12:51 PM. Firstly, many thanks for one of the best plugins I've ever had the pleasure of using! I have recently upgraded to the latest iteration and am finding that the warden mastery skill Spear - Shield doesn't seem to be working correctly. When I use it in a sequence the skill fires correctly but then rather than moving to the next slot, it stays as the active skill and goes into cooldown, stopping the sequence from advancing. Thanks again for all your work on the plugin! Edit: Also finding that the Directory view in the plugin manager is not updating after I move a bar from one group to another. The bar disappears from its old group but is not shown in the destination group. Last edited by Danglin : 01-28-2019 at 03:47 AM. How can I set my preferred bag slots for my Sb? So is it possible to set the item location permanently to a different slot? You set your preferred bag slots with a special slot: "Set unequip destination". Create a new bar. The name doesn't matter. 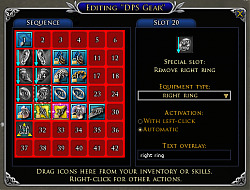 Right-click the new bar, choose "Edit sequence..."
Right-click the first slot, choose "Create special slot" and "Set unequip destination"
On the right side, under "Activation", choose "Automatic". Close the sequence editor window. Right-click the bar and choose "Hide". This bar, though invisible, will run each time the plugin is loaded. To edit it in the future, you can access it in the bar directory (go to the Plugin Manager, choose SequenceBars on the left, and click the Options tab on the right). 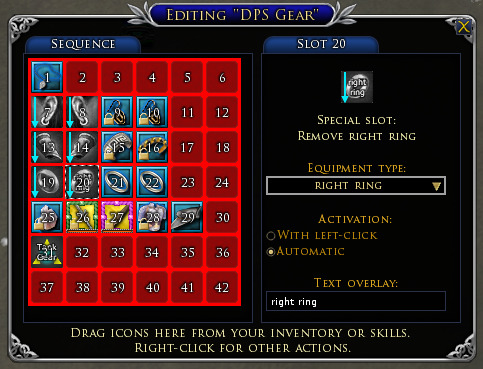 Note: This feature only works when you unequip items using the "Remove equipment" special slot in a sequence. It doesn't have any effect when you remove an item by equipping something in its place. Last edited by Thurallor : 11-08-2018 at 06:55 PM. /sb options : Opens the main options panel. /sb event <event> : Triggers the specified user-defined <event>. /sb events : Lists the currently-defined events (if any). /sb sort <slots> : Sorts the items in the specified inventory bag slots. if i use the /sb sort command, it will only change the position of the item in my Bag until its equiped, after that when i unequip that item, it places the item in the old position. Last edited by Akheras : 11-08-2018 at 11:28 AM. Is it possible to emulate the "attack button" from the UI with a command in Sequence Bars? I think if you make a special slot with the "/useselection" chat command in it, it might work. Otherwise, no. Confirming that this works. Thanks! Last edited by Thurallor : 10-29-2018 at 03:42 PM. Grawpy's issue is fixed in version 3.33. I did originally try to use the set unequip destination. I am new with these plugins, but I have been playing for some time. I saw how valuable and useful this plugin would be for me, so I downloaded it. I am trying to use it as a fast gear swapping mechanism, but when I change equip an item the chat shows a message of "SequenceBars: Your bags (slots 90) are full." I see in my bags that the space it is referring to is full, but I have many other slots empty. Is there a setting I need to use, that I do not know about. Currently my gear swapping is only using the "remove equipment" special slot. Like I said, I am new at this. Thanks anyway. Thanks for reporting the issue. It does seem to be not working the way I intended. I assume you are using the "Set unequip destination" special slot, and you have specified 90 for your "preferred bag slot(s)." The plugin should look for other empty bag slots if slot 90 is full, but apparently it's not doing that. As a workaround, you can change your "preferred bag slot(s)" to the following: "90...135;1...89". I'll fix this in the next version. Last edited by Thurallor : 09-19-2018 at 12:15 PM. The plugin cannot simulate keypresses. That is an intended limitation by SSG. Every skill execution must be accomplished by either clicking with the mouse, or pressing a hotkey. All the plugin can do is move the quickslot under your mouse cursor, to make clicking easier. However, the plugin can do some things in response to a hotkey, if you configure it correctly: reset a sequence; show/hide a sequence; move the sequence under the mouse cursor; etc. If you tell me exactly what you would like to do, I might be able to give more specific information: whether it's possible, and if so, how to do it. I'm an avid user of your SequenceBars tool. Thank you for sacrificing your time to make Lotro even more beautiful. I have a question, and I do not know if I am right or not. As far as I understood that too. But what do I do if I am eg. put a function on a letter. In my case, it's the in-game mailbox. I put this on the P key. Can I somehow incorporate the letter P into my sequence? I've been looking for a long time to implement such a "function" somehow. I do that by creating an alias shortcut activating a user event. hotkey Shift-1 triggers user event SBUE1. Take it from there - hope it helps. Amazing piece of work as always Thurallor - THANKS!